Rug cleaning is something we feel very proud of. 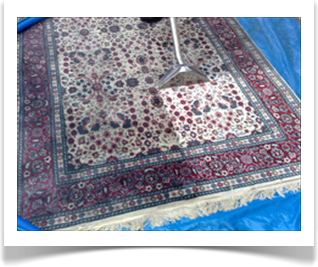 We regularly clean all types of rugs, not only for domestic clients but also for commercial and industrial premises. It is the constant attention to detail that enables us to fantastic results come rain or shine. Cleaning, repairing, insurance inspections are all part and parcel of our list of services. 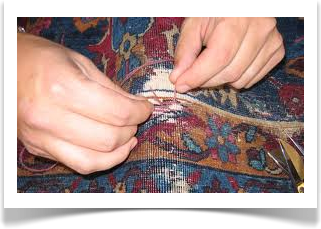 Our rug repairs are second to none in this specific field of expertise. We carry our repairs to oriental, modern and antique – whether it be for fringe damage or the rug itself. So if you want your rug looking great again, contact us for more information. We will visit you free of charge and offer a full survey to assess what requires to beundertaken, thus achieving the result the rug deserves. Cleaning of rugs are a vital step towards maintaining not only the look of rugs, but the longevity of them. Rugs can be very personal and usually have a little history around them – and we respect them as if they were our own. We remove dust and debris, thoroughly clean them (sometimes by submersion techniques), dry them and finally protect them with Scotchguard to make them last longer (if required) – and return them all fluffy and hygenically clean. Leave in the sun once or twice a year with the sun facing the back of the rug to destroy enzymes. Lightly vacuum the back and front of the rug once a week – do not vacuum the fringes. Beat the rug once a year over a washing line to remove dust and dirt. Turn regularly to ensure the wear of the rug is even. Comb or brush out fringes using a broad tooth brush. Use protectors on chair legs or tables to protect the rug.